It really is about time I sorted out my 2013 challenges - I'm much later signing up for these than I usually am but at least I'm finally getting organised! 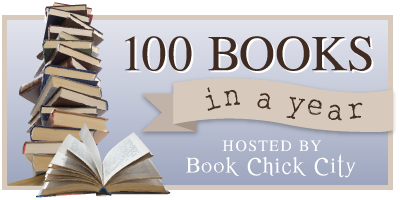 I love taking part in Carolyn's 100 books in a year challenge and have been taking part since I first started blogging so this will be my 4th year taking part. I'm sticking with my goal to read 200 books rather than 100 though and I'm pretty confident that it won't be a problem. That was my only worry about taking part in this one - that I easily surpassed 100. So if I set myself the same target as my Goodreads one, I should be OK.Do you count the ones you have already read or are you starting from now? Hi Viv, sorry I only just spotted your comment! I always end up reading more than 100 books but I enjoy taking part in the challenge anyway and it's a nice way to keep track of the books I'm reading. Goodreads keeps a running total but it includes all the novellas and short stories you read too (and I read quite a few of those!) so I can't count on their total to be correct.